Eliminate injuries caused by heavy ramps such as pulled back muscles, smashed feet, and severed fingers that lead to worker comp claims or law suits. 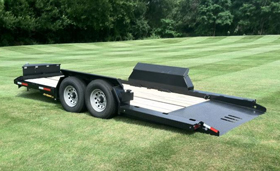 Save time & money as loading/unloading can be done with-or-without tow vehicle being attached. Avoid equipment damage as low approach angle protects equipment from damage caused by falling off ramps during loading and unloading. Ability to load any low clearance equipment quickly and safely due to low approach angle. Applications: Skid Steers, Scissor Lifts, Fork Lifts, Construction, Farming, Industrial Cleaning Equipment, plus so much more. For assured safety of load, in case of accidental hydraulic line damage. Reduces time with added safety. 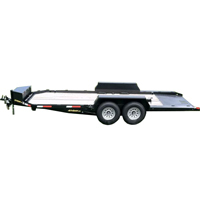 Break lug nuts loose, apply blocks under each rear corner of trailer, and lower unit to raise tires off the ground. Axle Rating: 2 x 7,000 lbs.